The less fabric sticking to your skin, the better! 1. An off-the-shoulder looker will super-billowy sleeves. Get it from Amazon for $5.80+ (available in sizes S-2XL, a variety of prints). 2. A darling tunic that's picture perfect tucked or untucked. Variety! Get it from ModCloth for $44.99 (available in sizes 2XS-4X). 3. 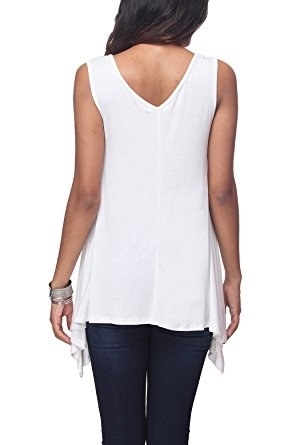 A V-neck tank with criss-cross action that still manages to look demure. Get it from Amazon for $9.99+ (available in sizes S-3XL, 16 colors). 4. This pintuck cami that *just might* make your mundane work day feel like a vacation instead (tropical drink not included). Get it from Old Navy for $35 (available in sizes 1X-4X, two patterns). 5. This pretty garden look with lots o' room for circulation. Promising review: "I love this shirt! I first bought it in blue and came back and bought the white too! It fits as expected. I run between an XL and XXL and the XL was great. The shirt flows well and it not tight at all! So cute!!" —Mom with 2 Cuties! Get it from Amazon for $5.99 (available in sizes S-3XL, four colors). 6. A one-shoulder denim shirt packing in allll the current trends. Get it from Asos for $56 (available in sizes 14-24). 7. A flouncy crop sure to make your Insta pics shine. Get it from Forever 21 for $35 (available in sizes S-L, two colors). 8. 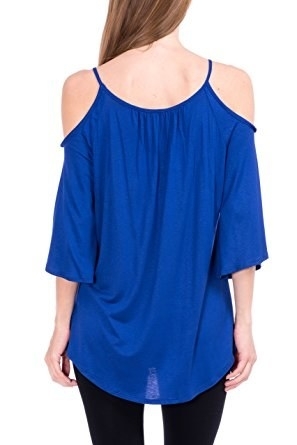 A cold-shoulder top that still has lots of arm coverage. 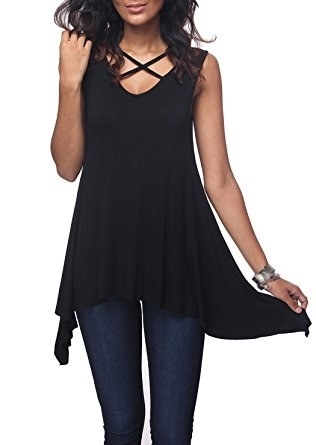 Get it from Amazon for $8+ (available in sizes S-XL, 13 colors). 9. A crochet-accented shirt with all kinds of details to write home about. Get it from Forever 21 for $25 (available in sizes 1X-3X, two colors). 10. A retro-ish armhole tank that screams "Let's get physical, physical." Get it from Urban Outfitters for $14.99 (available in sizes XS-L, five colors). 11. A breezy chiffon blouse for days when you've gotta cover up, but don't want to feel like you're sitting in a sauna. Get it from Torrid for $48.90 (available in sizes 00-6). 12. An alluring crop top trimmed in tassels anxiously awaiting a swift gust. Get it from Nasty Gal for $40 (available in sizes S-L). Matching shorts here. 13. This mesh tank built for maximum ventilation. Get it from Urban Outfitters for $9.99 (available in sizes XS-L). 14. 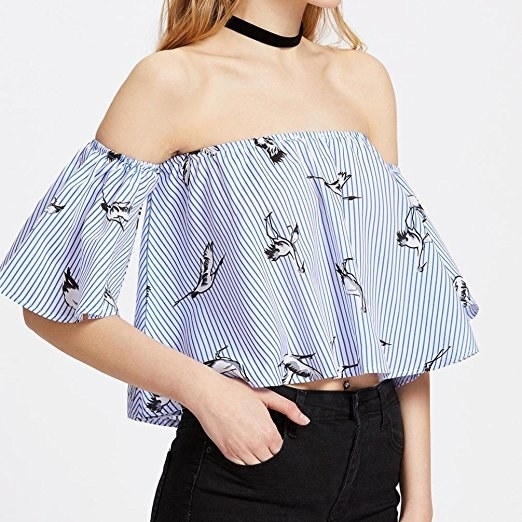 This office-appropriate top with an equine print a horse girl would never say neigh to. Get it from ModCloth for $39.99 (available in sizes XS-4X). 15. This party-in-the-back tank with an adorable crochet panel to help you avoid weird sweat stains. Get it from Old Navy for $22 (available in sizes 1X-4X, four colors). 16. A ruffled masterpiece for when you just can't with opaque fabric. Get it from Nasty Gal for $45 (available in sizes S-L, two colors). 17. A woven cami with a stunning silhouette that makes it look like you snagged it at a fancy designer sample sale. 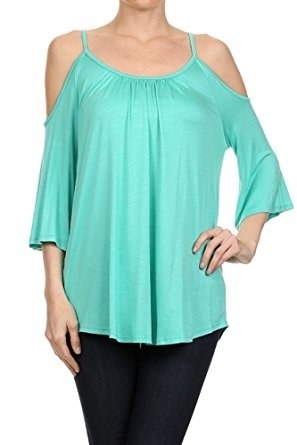 Get it from Forever 21 for $9.90 (available in sizes XS-XL, three colors). 18. A simple choker tank that'll most likely go with 99.9% of the stuff in your closet. Get it from Target for $7.78 (available in sizes XS-2XL, three colors). 19. A delicate tank, so you can look as steamy as the temp while feeling as cool as a cucumber. 20. An airy T-shirt worthy of a spot in your summer ensemble rotation. Get it from Urban Outfitters for $14.99 (available in sizes XS-L, two colors). 21. 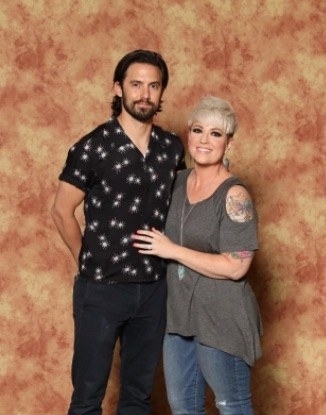 And cold-shoulder tee perf for when you overheat but have to play it cool while finally meeting Milo Ventimiglia. 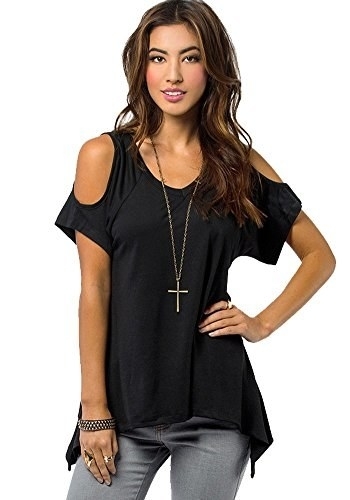 Get it from Amazon for $9.90+ (available in sizes XS-3XL, a variety of colors). Ahhhh, as refreshing as a dip in the pool on a hot summer day.